WINSLOW, Maine -- A horse and a camel at a Maine petting zoo have formed an unlikely friendship: Caesar, a 5-year-old camel, has become a guide for Dolly the horse, who is blind. “She’s probably the only horse that has a Seeing Eye camel,” said the zoo’s Ed Papsis, CBS Portland affiliate WGME reported. Papsis said Caesar needed the company of another animal and Dolly needed a guide. “We put the horse in there and she just kind of bonded with him and he bonded with her,” Papsis said. 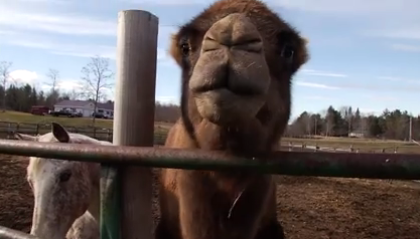 Dolly relies on the camel -- both of them at the traveling Pony X-Press petting zoo in Maine -- and follows him around. She whinnys for him if he’s not nearby and he bellows back for her.